65 million years ago, dinosaurs ruled the earth–and now they are going to be taking the stage at State Theatre New Jersey in Erth’s Dinosaur Zoo Live on Sunday, April 30, 2017! Audiences will experience a pre-historic journey with dinosaurs such as Plesiosaurs, Triceratops, and of course, a mighty Tyrannosaurus Rex! Don’t worry though, all of these dinosaurs are incredibly friendly and handled by an accomplished team of puppeteers. In the early 1990s, Erth Visual & Physical Inc. wanted to impress audiences with larger than life visuals. The Australian based production company began developing shows that involved giant puppetry, stilt-walkers, inflatable environments, and flying creatures. 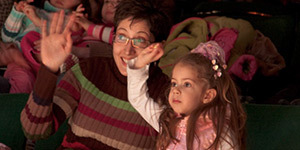 Erth gained attention for its high production value and stunning visuals, which created the opportunity to take the company’s most popular show, Erth’s Dinosaur Zoo Live, on tour. 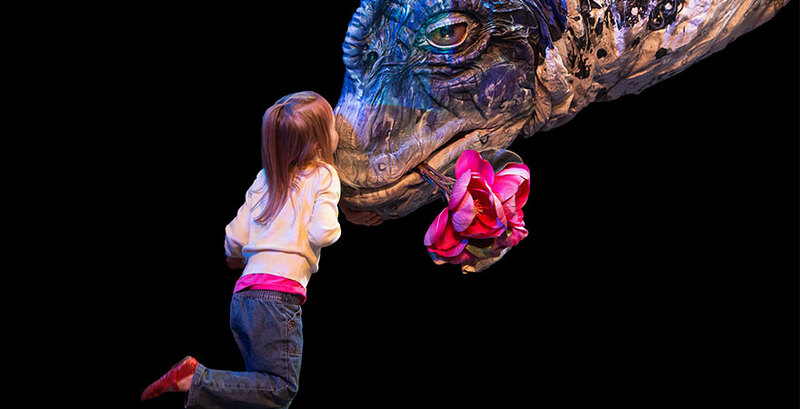 Perhaps the most exciting aspect of Erth’s Dinosaur Zoo Live is that audience members can have the opportunity to get up close and personal with these massive dinosaur puppets! Some may get the opportunity to share the stage with these larger than life creatures, while some creatures may visit audience members directly in their seats. Everyone will be amazed by each dinosaur’s unique personality and intricate design, such is the case with the feather covered T-Rex. While most people view the T-Rex as a scaly reptile, these dinosaurs are created to match current theories on their anatomy, which includes the idea that the T-Rex’s back and head are covered in feathers. Without a doubt, audiences will be impressed with these detailed giants! Check out our interview with lead puppetter Miron Gusso for even more details about these incredible puppets! No one will want to miss this event that has been 65 million years in the making! Come see Erth’s Dinosaur Zoo Live at State Theatre New Jersey on Sunday, April 30, 2017 at 2pm and 5pm!